Yes you read that correctly, Garden & Gun Magazine. I know, I know what you are thinking, guns and gardens, what the heck is going on here www.gardenandgun.com. At this point in the conversation most people have scrunched their faces into questions mark, utter some snide remark, about camouflage or moonshine. That reaction always riles me up a bit, to me that is akin to saying you don’t like a particular food, because you don’t know what it tastes like. Yes, this magazine is devoted to the South, are there hunting and gun articles, yes, and sometimes fishing is featured, how scandalous can it get. The magazine’s tag line is, “Soul of the South”, and truer words are not spoken. There are regularly featured columns regarding Southern Traditions, including music, art, literature, food (of course), and entertaining. At times they have gone off the Southern map, to highlight some other great locales of interest, usually they help create a trail, that weaves it way in and around the Southern landscape. I have subscribed to this magazine for about four years now, it’s the only magazine that I truly read, cover to cover. This month’s issue, hands down, my most favorite of them all, The Southern Food Issue. Although the Made in South Awards issue is right up there too, and of course there is the Southern Food Bracket every year during March Madness. Nope, the clear winner is The Southern Food Issue, and here are just a few reasons why. Each year there is a bounty of off the beaten path local must try food joints, stunning food photography makes you want to eat the page. 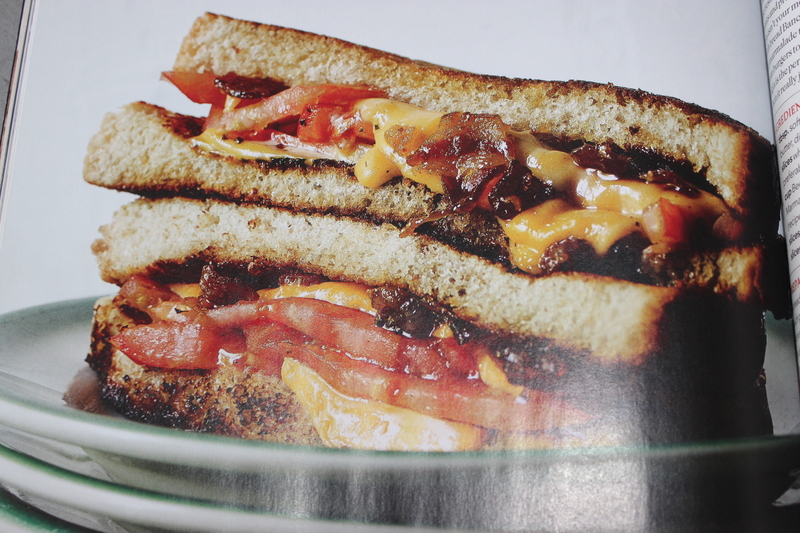 Pictured below is a tomato gilled cheese sandwich, which at face value looks pretty amazing. However, upon perusing the recipe, you will find one of the ingredients is Beer and Bacon Marmalade, uh wait what. Yes, beer, bacon, cheese, tomato, all wrapped in gooey goodness, hello, coming to a skillet near me ASAP! The little gem above, has an ingredient list that boasts Pickled Charred Shallots, and Sorghum Vinaigrette. There is a produce stand at the weekly downtown farmers market, that has wonderful heirloom tomatoes. 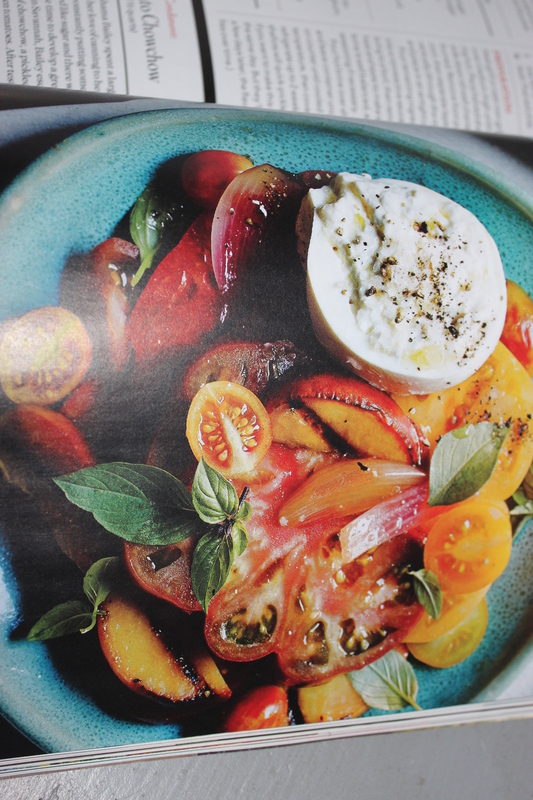 There is nothing so lovely on a summer day, as eating a tomato, fresh from the garden still warm from the sun. No one, will ever be able to grow tomatoes like my Grandpa Bailey. However those at farm stands, and farmer’s markets do come in a close second. Also, never refrigerate tomatoes, it just ruins the flavor. This is issue does includes several poignant articles, including the late great B.B. King, and Hurricane Katrina’s effect on a group of classmates. One not to be missed, is the interview with high school coach John McKissick, the winningest football coach in history. He retired from a South Carolina school after coaching for 63 years. A must read for anyone, that ever had an inkling of trying to coach young adults. His prospective is simply amazing. 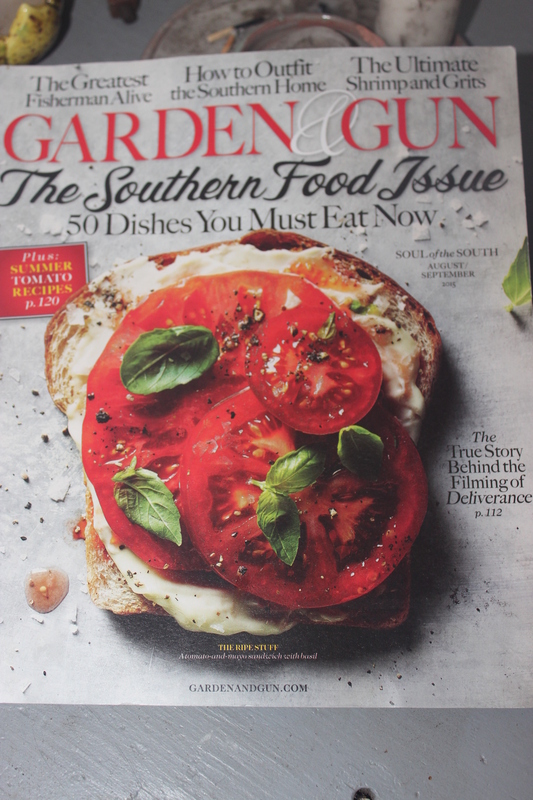 So there you have it, Garden & Gun Magazine, Soul of the South. 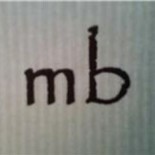 This entry was posted on July 19, 2015 by mb in Coffee Klatch, Reviews and tagged Etc..., Family, food, life, magazine, recipes, review, The South.